Today I’m sharing a recently completed interior design project for some wonderful Chattanooga clients I’ve worked with for years! For a frame of reference, here are a few other rooms in their home we’ve had the pleasure of transforming with them. The foyer, seen below, was recently updated with architectural moldings, fresh white paint, a new light fixture and new furnishings. Another fun project was this breakfast nook in the kitchen. We designed and custom built the window seat, updated the light fixture and furniture, and finished it off with custom window shades and pillows. We then moved on to their living room seen above. New moldings, window treatments, a fireplace makeover and new furnishings all came together to create a welcoming space that’s comfortable enough for family but fancy enough for guests. Our most recent project with this family was a makeover of the master bedroom. The homeowners were craving something light and simple. They were so pleased with the previous projects we had worked on together that they wanted to continue in that same vein. Here’s quick photo of the room as it appeared before any work started. 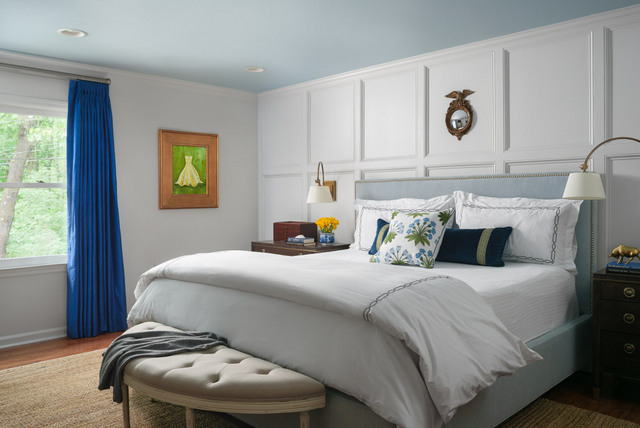 We agreed that we would lighten the walls, add some interest to the bed wall with architectural moldings, and keep the palette light and simple. Our clients also had a few pieces that were particularly meaningful to them and requested that we incorporate those pieces into the design of the room. And they love blue. Here’s a mockup of the space I created to help them visualize how the finished room would look and feel. We were definitely going in a lighter, simpler direction with some textural elements. The mostly neutral bedroom would include accents of their favorite color too! The moldings add interest and importance to the bed wall. We went with a custom upholstered bed in a soft shade of blue accented with silver nail heads. Gorgeous and restful! Our clients opted for these stylish wall sconces instead of lamps. I love a dash of the unexpected! Did you notice the ceiling color? We brought a little more blue into the space by painting the ceiling a lovely sky blue. We were also able to incorporate their painting for another shot of nature inspired color. The turquoise pottery vase was another special piece they wanted to incorporate. It was a found on a recent vacation and brings those memories back whenever they see it. We also went a little bold on our fabric selection for the curtains. They’re silk dupioni and really create a feeling of luxury in their bedroom. The curtains are lined with blackout and are mounted on a traverse rod for greater ease of use. These little details really go a long way to create an exceptional space! We’re so pleased with how this bedroom came together and I can’t wait to work with these wonderful folks on their next project.